Mahouka Koukou no Rettousei (or, "The Irregular at Magic High School") is a light novel series by Tsutomu Satou about a guy named Shiba Tatsuya, and his sister Miyuki. The light novels currently span 16 chapters, with more to come in the future, and follow both siblings through their high school lives, with chapter one beginning on their first day. Light novels, currently 16 chapters published. First volume was released on July 10, 2011, and the series is still ongoing. Written by Tsutomu Satou, with illustrations by Kana Ishida. An anime series spanning chapters 1-4, and 6-7 of the light novels, omitting chapter 5. Running from April 5, 2014 to September 27, 2014, it was produced by Madhouse. Alongside the anime, an OVA series of short episodes was released, titled Mahouka Koukou no Rettousei: Yoku Wakaru Mahouka. These feature 'chibi' style variations on some of the series' characters, and attempt to provide some insight on some of the concepts that the anime doesn't spend much, or any, time explaining. 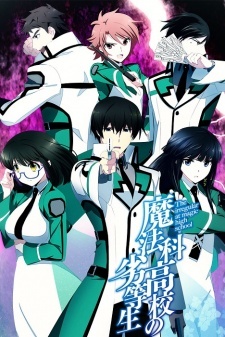 Mahouka Koukou no Rettousei (or Mahouka Koukou no Rettousei: Nyuugaku Hen), which follows chapters 1-2 of the light novels, and ran from December 17, 2011 to September 18, 2013 with 4 volumes. It was written by Fumino Hayashi and Tsutomu Satou, with illustrations by Kana Ishida. Mahouka Koukou no Rettousei: Kyuukousen-hen, which follows chapters 3-4 of the light novels. Running from October 18, 2013, it is still ongoing and currently has 3 volumes. It is written by Tsutomu Satou with illustrations from Kana Ishida. Mahouka Koukou no Rettousei: Yokohama Souran-hen, which follows chapters 6-7 of the light novels. Running from October 18, 2013, it is still ongoing with 3 volumes at present. It is written by Tsutomu Satou with illustrations from Gin Amau. Mahouka Koukou no Rettousei: Tsuioku-hen, which follows the flashback potions of chapter 8 of the light novels. Running from February 27, 2014, it is still ongoing, currently with 2 volumes. It is written by Tsutomu Satou with illustrations from Waki Ikawa. Mahouka Koukou no Yuutousei, a spin-off manga that follows the story through the eyes of Miyuki rather than Tatsuya. Running from April 27, 2012, it is still ongoing and currently has 5 volumes. It is written by Tsutomu Satou, with illustrations by Yu Mori. Mahouka Koukou no Rettousei: LOST ZERO, a mobile game for Android and iOS produced by BeXide and Square Enix. It was released on September 4, 2014. Mahouka Koukou no Rettousei: Out of Order, a game for the PlayStation Vita produced by Bandai Namco Games. It was released December 25, 2014.